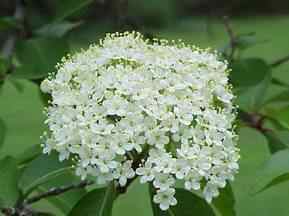 Tree: Small bushy tree or shrub. Wide rounded top, tough tortuous branches, 30 feet high. Bark: Dark reddish brown, prominently ridged. 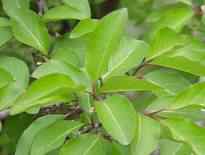 Leaves: Lustrous dark green, 2.25 to 5 inches long. 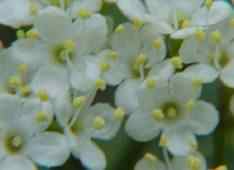 Flowers: Large flat clusters of small white flowers about 3 to 4 inches across. Fruit: Ripe in september. Blue black borne in drooping clusters, stems red. Good to eat. Stone is flat, oval.